As with glow engines, diesels achieve optimum performance with an appropriate combustion chamber volume and shape. Traditional diesel engines have a "full bore" contra-piston that is moved up/down to adjust combustion chamber volume. shims, to suit the intended fuel and operating load. Fine adjustment is made using the small adjustable contra-piston in the usual manner, depending on atmospheric pressure and humidity variations during the flight day, or use of slightly different propellers. Your engine has been factory set with a clearance of approximately 0,28 - 0,30 millimetres between the cylinder head and piston at the top of its stroke. This is optimum for operation at sea level with the recommended propeller and fuel mixture given for running-in. Adjustment of the contra-piston via the compression adjusting screw will give a wide range of operating speeds. If you need more compression than is available, remove a shim, back off the contra-piston a little (to allow for fine tuning) and reassemble. 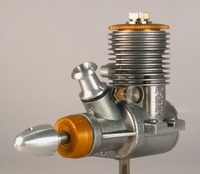 established the in-flight compression setting, then remove the head and inspect the contra-piston position. 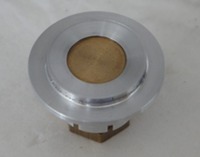 If it is significantly recessed, add a shim and adjust the contra-piston down to restore the desired compression ratio. It may require several such adjustments to arrive at the ideal position. Sometimes the engine may have compression leaks in the head. It can create problems with engine start. Check the head shims are not damaged and if all right, place a few drops of Automotive oil between the head shims and the diesel head, then retighten the cylinder head. A special screw links the contra-piston and compression adjusting screw. This enables the "pull" action when decreasing compression. It is not necessary to disassemble this. However, should the screw become loose (this can lead to excessive slack when making compression adjustment) proceed as follows. The link screw has a M4 LEFT-HAND thread (some early engines have M3), meaning it is tightened/loosened in REVERSE to normal. Remove the screw and carefully clean the screw and contra-piston threads. Reassemble with a little industrial grade high-temperature epoxy resin such as JB WELD, UHU, NURAL or similar. Never use Loctite or similar thread locking compound, because heat will soften the adhesive and the screw will come loose. The silencer is very light and needs some careful handling. It should slide easily onto the engine's exhaust collector stub. Damage results if force is used. 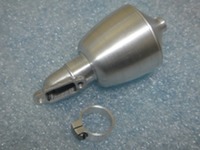 If necessary, reduce the outside diameter of the engine's exhaust collector stub very slightly. First, push a wad of tissue paper tightly into the exhaust stub, to keep out foreign material. Then, using a fine flat file or a piece of medium grit wet/dry sandpaper wrapped around a steel ruler (and moistened with a few drops of oil/kerosene mixture), lightly smooth the surface where the silencer will go. Wash the collector stub with solvent and smear with clean oil before fitting the silencer. Crankpins come with some different tolerance sizes (0,05 - 0,010 mm). The tolerance number (0, 5 or 10) for each crankpin is marked on the back of the crank web. 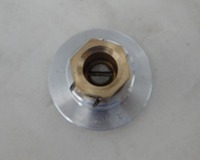 Matching a connecting rod with the appropriate big end bearing size is necessary to obtain the optimum fit with your crankpin. If required, send your crankshaft to us for fitting an appropriate connecting rod. We have the necessary tools for the job and this service to you is free of charge. This engine is intended for operation at relatively high revolutions, which can be obtained by using propellers with a maximum diameter of 8 inches (200 mm). We recommend that loading the engine with a larger propeller be avoided, as this can lead to rapid wear of the piston's wrist pin holes, especially with SSC (steel piston) engines.